2. Press the button until the User setting mode is displayed. 3.You can change the item by pressing the ▼ button and select an item by pressing the button. If the auto triple turn function is checked : The lane change signals will blink 3 times when the turn signal lever is moved slightly. If the welcome sound function is checked : The Welcome Sound function will be activated. - 100% : The size of the numbers on speed gauge is normal state. - 110% : The size of the numbers on speed gauge will increase. 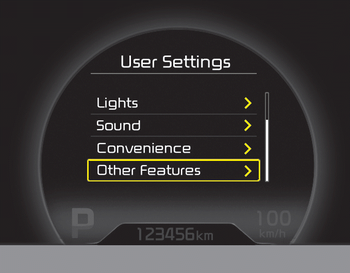 You can choose the displayed unit in the instrument cluster “km” or “mile”.